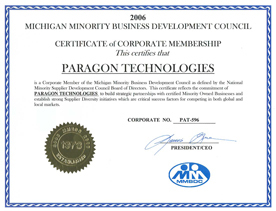 Paragon is committed to developing mutually advantageous business relationships with minority owned businesses. Paragon believes in diversity and will include all qualified suppliers in bid opportunities. We seek the best-valued, highest quality products and services by encouraging competition among suppliers. Our efforts in developing minority supplier relationships benefit our customers and the communities in which we live and work. We seek the best-valued, highest quality products and services by encouraging competition among suppliers. Paragon seeks the best quality, value and service, at the best cost from all of our suppliers. It is our desire to select suppliers who deliver the best overall value; value that consists of competitive pricing, technological foresight, information management, and continuous and proactive support of products and services. All purchasing policies are based on standard business practices, with suppliers chosen on their ability to meet company needs competitively.